Louisville, Kentucky — Summer is the season when homeowners spend the most time enjoying their outdoor living spaces. According to a recent homeowner survey conducted on behalf of the Propane Education & Research Council (PERC), more than half of them are looking to extend the outdoor season with easy, affordable home improvements. The survey, conducted in June 2009 by Opinion Research Corp., revealed that most homeowners see outdoor living spaces as an important feature of the home. And this year, more of them are spending leisure time close to home. Two-thirds of survey respondents who reported they are spending more time in their outdoor spaces than in years past said more home time is an alternative to going away on vacation. The challenging economy has shaped other outdoor trends as well. “We’ve surveyed homeowners for the past couple of years and see a growing desire to make better use of outdoor space, whether that space is a yard, a patio, or a deck,” said Paul Pearce, operator of Pearce Bottled Gas in Greenville, Indiana. The 2009 survey also revealed a preference for small improvements homeowners can make themselves, Paul Pearce said. “There are a number of affordable upgrades that can really change how — as well as how long — homeowners use their outdoor space.” Amenities that add convenience and comfort to space outside the home include grills, fireplaces, lighting, and bug eliminators. Homeowner preferences in outdoor home improvement indicate that U.S. leisure time isn’t all spent on leisurely pursuits. Survey respondents identified yard work, grilling, and gardening as the outdoor activities that they enjoy most frequently; this was supported by strong interest in lawn and garden equipment and gas grills. According to the survey, there is a strong link between improving outdoor living spaces and spending time there. Among homeowners who report spending more time outdoors than in past years, almost three of four say that’s because their improved spaces are more enjoyable. Almost nine of 10 homeowners plan to make additional improvements to their outdoor spaces; of those, most expect to do the work themselves, both to save money and because they enjoy it. Not surprisingly, regional differences shaped trends in outdoor living and preferred upgrades. In the northeast and north-central United States, appliances that extend the outdoor season are in demand. Homeowners looking for easy upgrades, like the majority of those surveyed, can add warmth and ambience with the simple addition of a table heater, a patio heater, or a propane fire pit. Unlike wood-burning fire pits, propane fire pits provide reliable, consistent warmth and don’t leave a mess. For survey respondents in north-central and southern regions, bug eliminators were identified as having a great effect on the enjoyment of their outdoor space. For areas where insects can ruin a relaxing evening outdoors, a propane insect eliminator protects up to an acre of outdoor space. These effective and affordable appliances turn propane into carbon dioxide, heat, and moisture to attract mosquitoes to the eliminator, which vacuums them into a net and away from family and friends. Homeowners who want to spruce up their space can use energy-efficient lighting solutions to create ambience and security. Propane outdoor lighting fixtures and lamps are available in portable, wall-mounted, and post-mounted styles. These additions are a great solution to create the perfect outdoor entertaining space for the 78 percent of homeowners who reported grilling outdoors but not eating or entertaining there as often. For homeowners like survey respondents who place yard work at the top of their outdoor activity list, propane string trimmers are available with easy-to-use, twist-on-and-off propane canisters that provide two hours of power. The trimmers produce less greenhouse gas emissions than trimmers running on other energy sources. The steel propane canisters are 100 percent recyclable when empty. This fall, a propane blower-vacuum and mulcher will be available to homeowners as well. 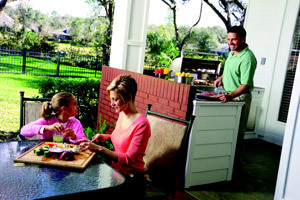 Homeowners can learn more about improving outdoor living spaces with propane and find a propane retailer in their area by visiting www.usepropane.com.